If you find that your home is getting cluttered, and you want to combine order with creativity, take a look at some of the examples below of simple and effective storage and organisation ideas. This desk tidy is so easy to make, all you need is an old frame or some wood and chicken wire. Nail the wire to the back of the wood or frame and you’re done. If you want to customise it, you could paint it to match your décor. This is perfect for a home office as you can peg up important letters, bills and notes, or you could make a smaller version for your bedroom to hang jewellery. If you’re a keen knitter, this wool storage solution is for you. All you need to do is fit a pegboard to your wall, or alternatively try putting it on the back of a door. As you can see in the picture, you can paint the board to match your existing walls. As well as being functional, this hack is also ornamental. If you are a keen crafter, you always need tread to hand. This hack is another artistic example that will double up as an interesting feature in your room. All you need to make this is a frame, card, and pins. Put card in the frame instead of a picture, and stick the pins in the card. Depending on the amount of thread you use, you could find a larger frame, or make a set of three smaller frames. Following on the frame theme, this pocket organiser is a real work of art. All you need is a frame and an item of clothing with pockets. This example has been made with an old coat, but you could easily use pockets from jeans, or even a variety of pockets from different items of clothing. This organiser would be a great addition to a study, or in your child’s room to store stationary. When you use bobby pins, you know how easy it is to lose them. You end up finding them every so often in random places around the house. 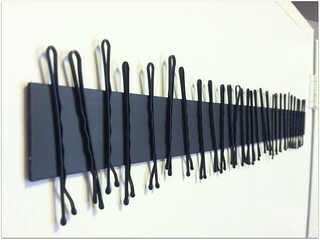 To combat this, why not make a bobby pin organiser? All you need is a magnetic strip, wood and glue. Put them all together and hang it on your wall. Each time you find a rogue pin, put it with your collection. If you use a lot of herbs and spices when you cook, you’ll no doubt go through lots of small herb jars. Rather than waste another container, start buying fresh loose ingredients and store them in these fantastic jars. All you need to do is collect a few small jars, paint the lid if you want to colour coordinate, and label the contents with a marker pen. We hope that these hacks have inspired you to start getting creative with crafty with storage solutions.